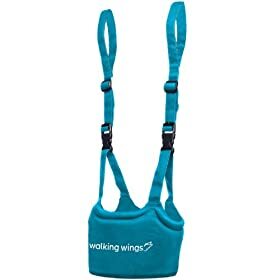 At first I wasn’t sure how I felt about this product, Walking Wings. To be honest, it seemed kind of odd to me to strap my baby up to this to help him walk. Then again, he’s only four months old and won’t be doing any walking for any time to come so I wasn’t able to test it out. But after reading some reviews and looking at the product in person, I can kind of see why this is appealing: it’s a great product for the parent. I remember walking with my oldest son and holding his hands up for several weeks before he got to walking on his own. And walking crouched over can be uncomfortable after awhile. With Walking Wings, you don’t have to bend over and they help to support your baby and direct them in how to walk. Check it out and decide for yourself. Walking Wings have been featured on the Today Show, and celeb sighting info: according to their PR firm, Walking Wings were used by Victorica Beckham (Posh Spice) and she has recently passed her pair off to good friend Katie Holmes for baby Suri. What do you think? Would you use the Walking Wings with your baby? Come share your insight and opinions on our new forum for Blog Comments on our discussion board. Americans: Have you traveled anywhere outside of North America?